With Valentines Day quickly approaching, I thought it appropriate to share a very easy recipe that looks very impressive. 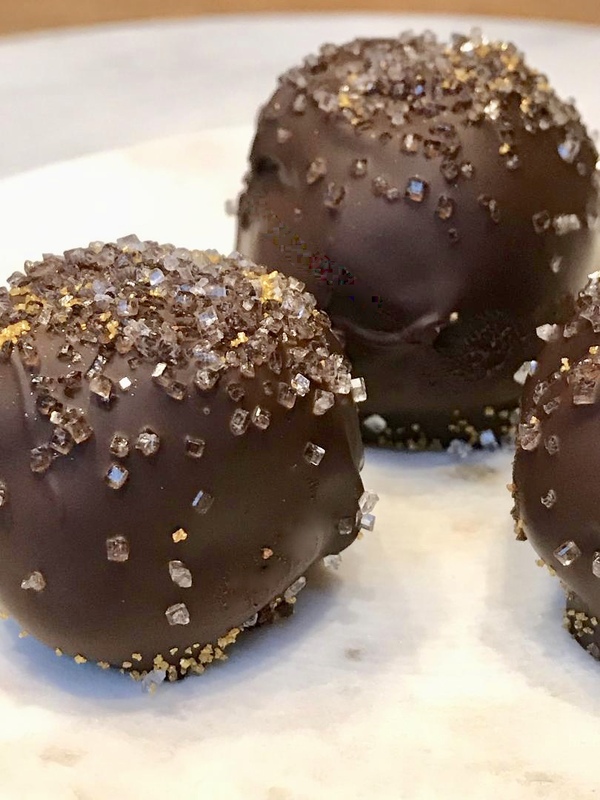 Treat your loved ones to delicious no bake truffles. I could eat these for dessert every night with a glass of wine and be one very happy lady. Chocolate + wine = one happy mama. I hope you enjoy this recipe and try it out soon. Pin it if you'd like to save it for later. I used a combination of clear and gold sprinkles. I plan on making another batch with white chocolate and pink heart sprinkles as the holiday gets closer! Mix together cocoa powder, flour, and salt. Set aside. Using a kitchen mixer, beat together sugar, butter, and vanilla, until light and fluffy. Slowly add dry ingredients to wet a little at a time, and alternating with milk, until completely combined. Roll the batter into 1" balls and place on a wax paper lined baking sheet. Place in the freezer for 15 minutes. While the truffles are in the freezer, prepare your chocolate shell. Melt your semi-sweet chocolate and butter in a microwave safe bowl in 30 second intervals, stirring frequently. Dip each truffle into the chocolate to completely coat, and set on wax paper to dry. Sprinkle any toppings on the truffles. Completely dry at room temperature for at least an hour before serving. You can also refrigerate for 30-40 minutes or freeze for approximately 20 minutes.